Dr. Andy Jones' students have a problem. As part of their English 45 class, they are required to conduct extensive research on a poet of their choice for an upcoming term paper. With class time growing short and the Olson computer screens only reflecting their worried stares, the students look helpless and a little squeamish. Dimming the lights and illuminating the audio-visual screen, Dr. Jones comes to the rescue, patiently demonstrating on his computer how to utilize the library database, search engines, and other Web resources to access the information his students need. Dr. Jones then discusses with the class how to evaluate the reliability of information found on the Internet, incorporate visuals into their papers, and properly cite electronic sources. As one of a record 48 UC Davis faculty, career staff, and Teaching Assistants who took part in a week-long conference aimed at facilitating the use of technology both in and out of the classroom, Dr. Jones learned a bevy of new computing skills. Now he finds himself on the other side, teaching his students how to become efficient users of technology. The sixth annual Summer Institute on Technology in Teaching (SITT) ran from Monday, July 26 through Friday, July 30. The wide-ranging program included discussions and workshops focusing on technological innovations, image manipulation, electronic communication, and multimedia. The workshop was well received, with attendees actively teaching about and collaborating on the trials and tribulations of educational technology. The resulting synergy has been unofficially dubbed the "SITT effect." 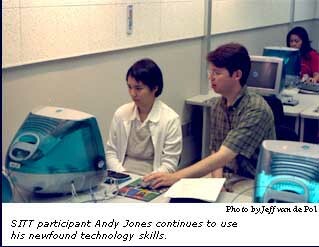 "Because of SITT, I personally feel much more comfortable sharing new technologies in the classroom," Jones reveals, "whether it be by experimenting with PowerPoint presentations in the computer classroom, assigning substantive and peer-reviewed Web sites as required reading for my courses, or talking with my colleagues about the function of academic and course Web pages." The "SITT effect" apparently is long lasting and benefits nonparticipants as well. "The packed folder and the inter-linked Web site provide resources for the instructors for months after SITT," Jones says. "I continue to rely on these materials for my own classes and in support of my role as the English Department's Coordinator of Computer-Aided Instruction." According to Barbara Sommer, a lecturer in the Department of Psychology and this year's SITT director, "A major goal of the institute is for participants to acquire a new or expanded set of technological tools that they can use in improving the teaching and learning process at UC Davis." With this goal in mind, the program was divided along thematic lines, with each day focusing on a specific topic. The morning discussions proved popular, as attendees availed themselves of the opportunity to enjoy the discoveries of their peers. These sessions also served as a unifying influence to the wide range of disciplines represented at the institute. Kevin Matson, a Teaching Assistant in Avian Science, states, "The morning talks were especially nice because they gave me the opportunity to see what others were doing. While the academic content had little relevance to my own field, I found the use of technology by the Economics and German instructors especially interesting." Dr. Jones concurs: "We so rarely get to see our colleagues teach! I so much appreciate the cross-pollination of ideas between professors from different disciplines. Experiencing presentations from professors in other departments functions very much the same way as experiencing the technology does: we learn new and innovative approaches to reaching our students." The afternoon SITT sessions provided a more tactile approach, as computer labs were utilized to supplement the morning's discussions and teach specific applications and skill sets. Sessions on image manipulation, especially the scanning of photographs and the use of images on the Web, proved so popular that extra lab sessions were created and a supplementary training program took place the following week at the Arbor. "I feel like I finally figured out how to use Photoshop, a program that previously had continually baffled me," Matson reveals. SITT serves as an example of successful interaction between the Division of Information Technology and campus departments. The program itself was led by UCD faculty, with assistance from the Teaching Resources Center and Information Technology. The latter two units, along with the Office of the Provost, sponsored the event. The result was a smoothly run and dynamic conference, with a healthy dose of Davis summer informality and humor providing a unique counterpoint to the high-tech nature of the institute. A listing of this year's events and participants can be found, along with a wealth of online resources, on the Web at http://trc.ucdavis.edu/TRC/sitt/. For assistance incorporating technology in teaching, contact The Arbor, a year-round extension of SITT, at 754-2115 or drop by AOB IV, room 174.